Contractualization did not stop; wages remained low and regionalized; the unemployment and underemployment problems continue to weigh down on a large number of Filipino workers. "In sum, it was "Isang B(D)igong Taon" on the labor front for President Duterte's first year in office," stated various labor groups in their one year assessment of the President's performance. It can be recalled that the President made a campaign pledge that contractualization will stop the moment he becomes the President. He also vowed to raise wages and abolish the system of provincial rates. 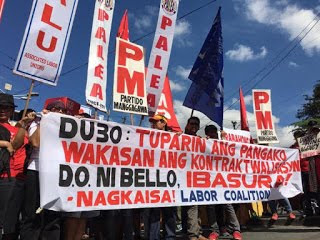 "We tried to rate the President's performance as objective as we can, but the outcomes for labor over his first 365 days have been generally wanting, have given us false expectations and given us many unfulfilled promises," said the workers groups in a joint statement distributed to media during a demonstration held at the Boy Scout Circle in Timog Quezon City, Friday. 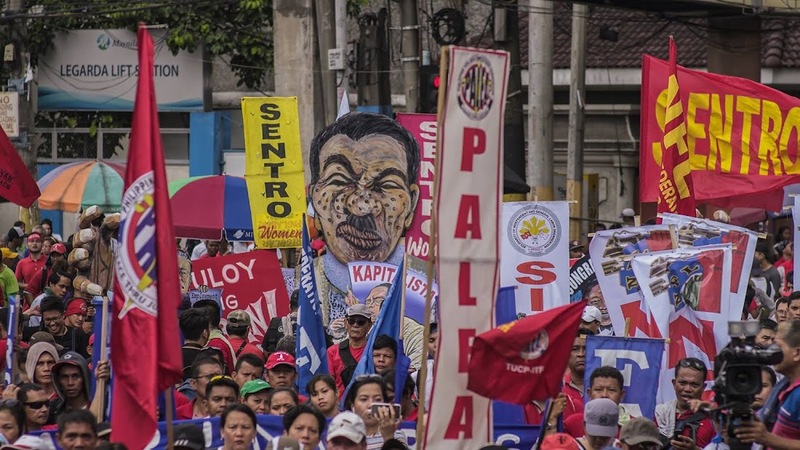 The mass action was organized by the Sentro ng mga Nagkakaisa at Progresibong Manggagawa (Sentro), Partido Manggagawa (PM), Federation of Free Workers (FFW), National Federation of Labor Unions (Naflu) and the Philippine Airlines Employees Association (Palea). Members of the World March of Women and Ateneo University's Union of Students for the Advancement of Democracy (USAD) also joined the rally. In a meeting on Labor Day, President Duterte asked labor groups to draft an Executive Order that would use prohibition of all forms of contractualization as a framework. This was after the unanimous rejection of labor groups of Department Order 174 issued by Labor and Employment Sec. Silvestre Bello III sometime in March. He also instructed the labor department to resolve with dispatch the years of dispute between PAL and PALEA on the issue of contractualization. In response the labor groups submitted a unified draft together with the formal labor sector of the National Anti-Poverty Commission. But almost two months from its submission, the President has done no executive action to address the rampant contractualization. "We have always advocated for a prohibition of all forms of contractualization and a stop to the abusive operations of manpower agencies and manpower cooperatives. The President himself at his assumption to power and in his first meeting with labor groups early this year openly expressed disgust over these as they 'abused workers,' using his words," said the groups. According to labor groups, DO 174 continues to permit contractualization and allows manpower agencies and manpower cooperatives to take a cut from workers' salaries each payday. There was also no certification issued by the President on pending anti-endo bills filed before the Congress. The PAL-PALEA dispute is not yet resolved. The only token victory they got on this respect, the groups said, is the planned deputization of trade unionists as labor inspectors, the first batch of which are now undergoing training at the labor department. Freedom of Association is also one of the areas where the President has a failing mark from the groups as organizing remains extremely difficult particularly in Economic Zones as workers get harassed and get fired for trying to organize unions. With the regional wage setting mechanism still in place, discrimination in terms of wages still persists across the country. The President said he was for a national minimum wage, but such policy pronouncement has not translated even to a working paper from DOLE that they can discuss with workers. "In the meantime the real value of wages continues to drop, power rates and prices of basic goods and services continue to climb, making it more burdensome for the working class. Meanwhile, the collection of exorbitant placement and other fees for OFW have not been addressed sufficiently if at all," added the group. In addition, the planned imposition of excise taxes on oil and the expansion of VAT coverage on goods and services under the Tax Reform for Acceleration and Inclusion (TRAIN), the group feared, will lead to further erosion of workers purchasing power especially those earning the minimum wage and below. The President, however, got a passing mark for being the first chief executive to endorse for Senate concurrence International Labor Convention 151 on Labor Relations in the Public Sector. The treaty, once ratified by the Senate, would guarantee the right to organize of public sector workers and allow them to bargain for better working conditions, among others. Asked why the President failed to satisfy workers' clamor for change during the last 365 days, the labor groups said, "It is expected when a leader quickly descends into a wrong war that only resulted to thousands of unsolved killings. While surveys have consistently showed that inflation, wages, and employment remain the top concerns of every Filipino." Labor Coalition Nagkaisa Chides PNoy: Hindi Tuwid, Hindi Tama, Hindi Makatuwiran Kapag Pag-unlad ay Para sa Iilan Lamang!